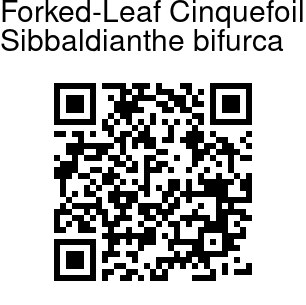 Forked-Leaf Cinquefoil is a perennial herb 5-20 cm tall, with partly underground stems. Aerial stems are usually ascending or prostrate, together with leaf-stalks and flower-stalks densely or rarely sparsely covered throughout with spreading or often erect-spreading, rigid hairs. Leaves are 3-8 cm long including the stalk. Stipules of lower leaves are brown, membranous. Those of upper leaves are ovate-elliptic, herbaceous, margin usually entire, rarely toothed. Leaves are compound, with 3-8 pairs of leaflets. Leaflets are oppositely arranged, rarely alternate, stalkless, elliptic or obovate, 0.5-1.5 cm × 4-8 mm, hairy, base wedge-shaped or broadly so, decurrent and adnate to rachis in distal 2 or 3 pairs of leaflets. Tips of the leaflets are entire, 2- or 3-forked. Flowers are yellow, 0.7-1.5 cm in diameter. Sepals are ovate, tip pointed. False sepals are elliptic, shorter than or nearly equaling sepals, sparsely hairy, apex pointed or blunt. Petals are yellow, obovate, slightly longer than sepals, tip rounded. Style is lateral, thickened and club-shaped at the tip. Achenes are smooth. 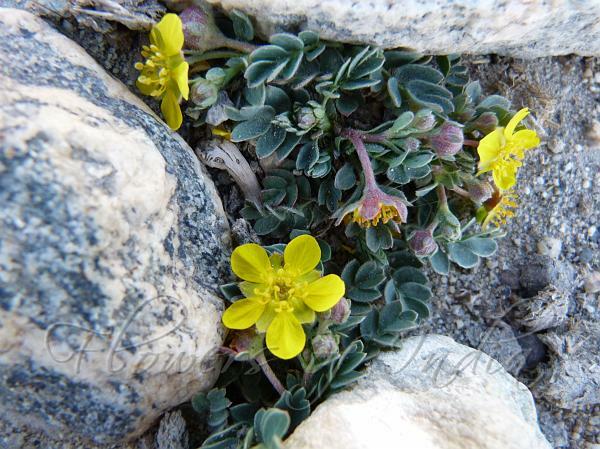 Forked-Leaf Cinquefoil is found in the Himalayas, from Pakistan to Bhutan and SW China, at altitudes of 2700-4800 m. Flowering: May-October.